President Trump, in budget documents to be released on Tuesday, will propose shrinking spending at non-defense agencies by $1.4 trillion over the next 10 years, with his administration acknowledging it had to make many “hard choices” to fulfill a promise to deliver a balanced budget. The long-term spending projections make the previously announced $54 billion in cuts in discretionary spending at domestic agencies a small down payment on the reductions that would get larger each year through fiscal 2027. The administration will pursue a “two-penny plan,” Office of Management and Budget Director Mick Mulvaney said Monday, meaning it will impose an annual 2 percent reduction in non-defense discretionary spending. The cuts will include shrinking the federal workforce. The documents the White House provided Monday did not spell out specific targets—OMB has said each agency will make its own determinations for how to slash their rolls—but did note that shedding employees would be part of the immediate cuts. The White House is proposing significantly steeper cuts going forward. In fiscal 2027 alone, the final year for which the White House made budget projections, the administration proposed slashing discretionary spending at non-defense agencies by a quarter of a trillion dollars. Domestic discretionary spending as a percentage of the gross domestic product would drop from 3.2 percent in the current fiscal year to just 1.4 percent. The previous low for the category of spending as a percentage of GDP was 3.1 percent—in 1962, according to the Center on Budget and Policy Priorities. The average since then has been near 4 percent. The $1.4 trillion in cuts to civilian agencies is part of a total package of $3.6 trillion in cuts to both discretionary and mandatory programs—including changes to federal workforce retirement programs—over the next decade. Trump would sharply reverse the Obama administration priority of matching any increases in defense spending with equal increases in non-defense spending; while the budget slashes domestic agencies through its reorganization efforts and two-penny plan, it would boost defense discretionary caps by $469 billion. Mulvaney said Monday the budget reaches its targeted reductions by eliminating programs that no longer serve the people they were intended to assist. He called the blueprint a “taxpayer-first budget,” explaining that each expenditure was put through the test of measuring whether the government could reasonably ask a family in Grand Rapids, Mich., to pay for it. For defense, border security and veterans services—all areas where Trump would boost funding—the answer was yes. For the Corporation for Public Broadcasting and certain programs designed to help students reach college, Mulvaney said as an example, the answer was no. As previously announced when the administration rolled out its “skinny budget,” the budget will propose money in 2018 for Immigration and Customs Enforcement to hire 1,000 new employees and Customs and Border Protection to hire 500 officers. Both figures are 10 percent of the number of new employees Trump ultimately wants to add to those agencies. In addition to money to begin building a wall along the U.S.-Mexico border, the budget would provide $1.5 billion to expand detention, transportation and removal costs associated with deporting undocumented immigrants. 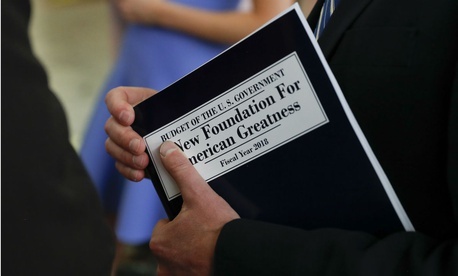 Parts of Trump’s budget already have met resistance from both sides on Capitol Hill, with Republicans calling some White House proposals dead on arrival. Rep. Hal Rogers, R-Ky, former House Appropriations chairman, said many of the cuts were “draconian, careless and counterproductive.” Mulvaney acknowledged on Monday that Congress was not likely to accept the budget “wholeheartedly without any changes,” but said the blueprint sends an important message. "'Here are my priorities of where I want to spend more. Here’s where I think we shouldn’t be spending nearly as much,'" Mulvaney said of Trump’s thinking. "'I want to be responsible to the taxpayers in a way we haven’t been before.' If Congress has a different way to get to that endpoint, God bless ‘em, that’s great."